Hello Unity and MISTI friends!!! for an amazing INSPIRATIONAL blog hop. LOTS to SEE and PRIZES to be WON. amazing stamped images over and over again. We have a BIG list of girls hopping today. So many beautiful things to see. May 30th at noon central time to be eligible. 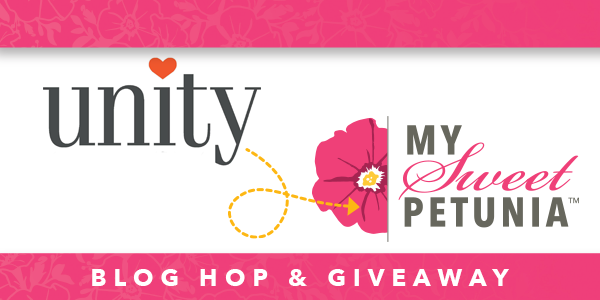 Unity and the My Sweet Petunia blogs on May 31st. My Sweet Petunia is the first stop in the hop, so click on their name and off you go. Continue clicking on each name in the list to finish the hop. you might want to GO SHOPPING!